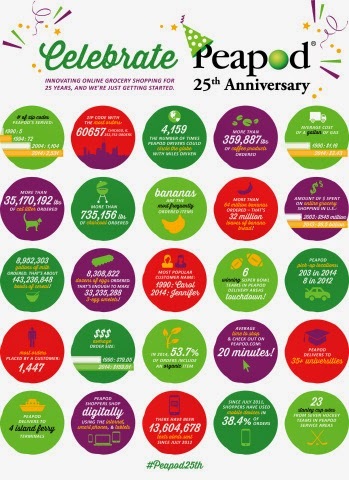 Dollops of Diane: Celebrating 25 years of Peapod with a Giveaway! Peapod – an Ahold USA company – is the country’s leading Internet grocer, serving 24 U.S. markets throughout Connecticut, Illinois, Indiana, Maryland, Massachusetts, New Hampshire, New Jersey, New York, Pennsylvania, Rhode Island, Virginia, Washington, D.C. and Wisconsin. Founded in 1989 by two brothers as a smart shopping option for busy households, today Peapod has delivered more than 29 million grocery orders. With over 15,000 products on its shelves for customers to choose from, Peapod strives to deliver convenience and value. Customers can order online or on Peapod’s free mobile app for grocery home delivery or car-side service at one of many Pick-up locations. So last Wednesday morning I went online and ordered my groceries. I ordered from my computer but you can also use an app to order the groceries directly from your phone as well. I like that you can sort grocery items by department, by what's on sale, and even find recipes. I always pick and secure my grocery pick up or delivery time first before I start shopping. That way in case a flood of people also start shopping I won't lose the time that I want. When I ordered on Wednesday morning the earliest time that I could pick up groceries was Friday morning. So timing is something you need to keep in mind. If you're going to be out of essentials before the end of the week, make sure to place your order a couple of days ahead of time. You can continue to add items to your cart until around the afternoon before (they tell you the specific end date/time when you order). So on Friday, Daniel and I headed to our local Stop and Shop to pick up our groceries during our designated one hour pick up window. I parked in one of the "Peapod Pick Up" parking spots and Carson (an always helpful and friendly S&S employee in Foxboro!) waived me over to the front of the store. On the sign there was also a phone number to call for an attendant if for some reason someone wasn't there right away to help you. So either way, you never need to go in the store. The sign also said that they do not accept tips which I had wondered about so I loved that the sign made it clear. So I pulled up, Carson loaded the groceries in my trunk, he brought over an invoice for me to sign, and I pulled off on my merry way. It was seriously, so easy. The fee for pick up is $2.95 (min order $60) which I think is reasonable. It's definitely something I would recommend - I mean you don't even have to get out of your car! Want to try out Peapod for yourself? Peapod and I are teaming up to offer a lucky reader a $25 gift card to use towards your purchase. Enter via the Rafflecopter form below!